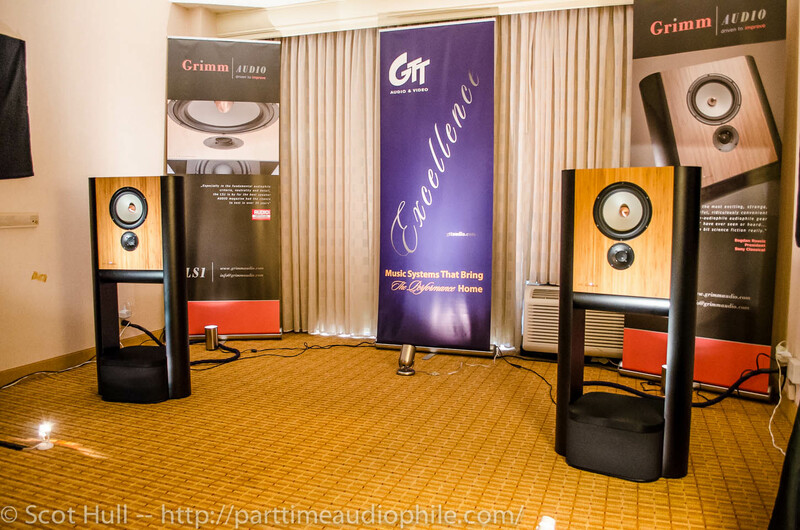 Grimm Audio's striking LS1 three-way loudspeakers (or I should say, sound system) was one of the really enjoyable surprises at the show. These compact and attractive speakers include a built-in AD/DA converter, CC1 clocking circuit, six NCore amplifiers, DSP processor, USB interface, preamp, subwoofers, and cables, kitchen sink… Ok, maybe not the kitchen sink. $39,900 gets you everything but the source. There's even both analog and digital inputs. I've had some great experiences with active speakers lately (see also PTE) but there's a tweaky part of me that finds the idea anxiety producing. What if I want to *switch something out*??? I'm beginning to think there's something to be said for designing everything to be perfectly matched, however. These things sing. We listened to a double DSD recording of Bill Evan’s “Waltz for Debbie” down-sampled to 96k. “Really kind of spectacular,” my notes read. The sound staging was excellent, the drivers perfectly integrated. I wasn’t even sure if the boxes on the floor were subwoofers until I examined them more closely. 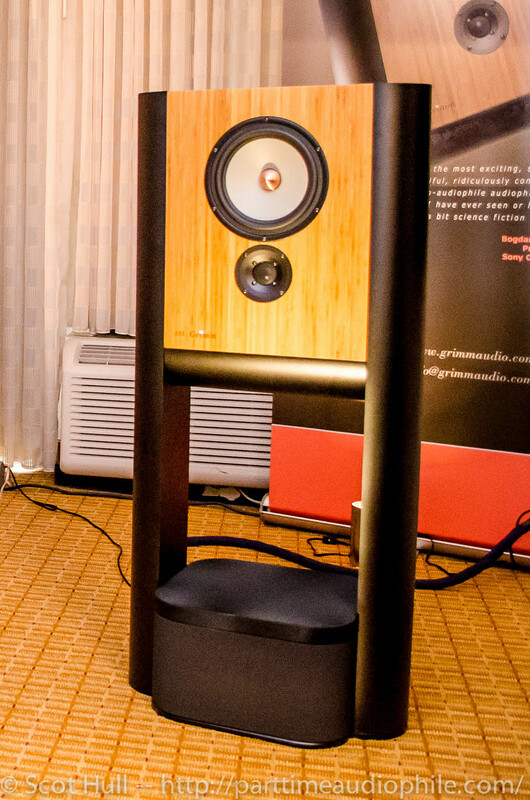 Although these speakers fit my own personal definition of “small” (which is to say, they would not be mistaken for refrigerators or large evil robots) they fill the room effortlessly. I was sufficiently intrigued to return later with a test track, a live recording of Sarah Vaughn performing “Like Someone in Love.” It’s an imperfect recording with quite a bit of tape hiss, but one I’m intimately familiar with. Vaughn’s voice sounded warm and dynamic, and the upright bass was beautifully textured. I suspect one reason I enjoyed these so thoroughly lies in their origins as studio monitors — the giant Altec 604s in my living room notwithstanding, I have a tendency to like my speakers relatively uncolored and transparent, and these are determinedly revealing. 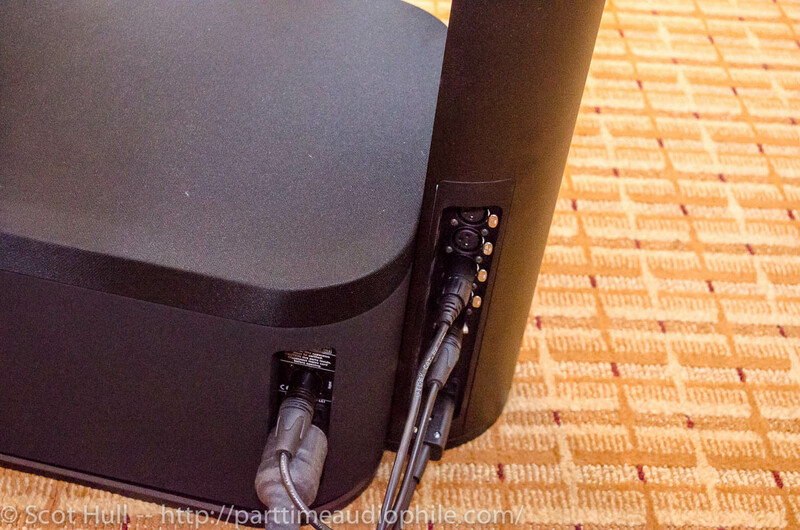 yep those active DSP speakers are the wave of the future. In the 70’s I had a pair Philips Motional Feedback bi amp’ed speakers, what fun they were. Now Meridian, and most studio monitors have gone with integrated bi and tri amping and DSP. My Bi amped Alesis Prolinear 820 monitors in my garage can pretty much shame most of $3000 audiophile speakers.The 820 DSP model even better; can Eq. for speaker placement.